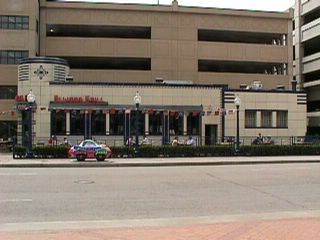 Here's a shot of the spiffy art deco Elwood Grill, situated right near Comerica park. It was moved from the corner of Elizabeth street and Woodward Avenue (which is where it's mane comes from, El-Wood) then restored thus saving it from demolition. It's a good thing too cause it's a rather cool piece of deco Americana. Note, colorful little art-auto sitting there on the sidewalk.